Feedback Session with Jigar Mehta: What next for #18daysinegypt? When does a project end? How do we build a database driven narrative? Jigar: On Feb 1st, we covered the Port Said massacre for the site, which stimulated the following stories; marches, funerals, more clashes, the motorcycle heroes – each of these moments were related but they were all told by different people. How do we relate all these stories that people were creating? Did you follow people’s stories up? Jigar: The majority of the best content has been created by our fellows through our fellowship program. They’re all young activists and have their own networks to spread their stories through. We’re also trying to build upon platforms that already exist such as user pages/ likes/ views/ follows. Is there another way you’re going to categorise all this content and how do new users navigate round the site? Jigar: How do we take this database and create a narrative? A lot of people think the projects done – this is because a lot of i-docs still follow the classic documentary style of a finished product – we haven’t done that. At the moment, you can rank by day and we’re hopefully going to produce a map feature and a sort of Facebook style timeline. Question still remains, how am I going to curate the story? How am I going to navigate you through this? This is something we’re still working on. Currently there is a tagging system that’s working at the moment: this could lead you through the site. Why do you no longer consider yourself a journalist? Jigar: My salary doesn’t come from a media organisation, but I have always classified myself as a storyteller. You’re looking for a unified concept or format here – does that work for the medium? Jigar: Once you jump in, it isn’t, it’s a mess. We’re torn about whether to add required fields to give it order or just let people tell their story in the way they want too. Arnau: Here lies the first interesting question: at what point do you want to control your information? Mixing journalism with the traditional form of documentary. Jigar: How do we lower the participation barrier without lowering the standard of content: what we have now isn’t getting 100% of the stories out there, so how do we get them? Why do you want to do that? You’ve already got a mass of material, what’s to gain from getting more? Is quantity the issue or quality? Jigar: It’s twofold, the first part is it’s a place where all these conversations are captured and give a space for people to add context rather than just Youtube. I want this site to be used in the future to tell these stories to the next generation and this site can give clarity to a very messy situation. This is not a one off project; we want to use this type of storytelling to tell other stories. Are you tracking demographics? Are older people using this? If not, could you to try and target new people? Jigar: We aren’t at the moment, but again the fellows are there to tell these stories and we sought them out. What is the context that’s added? Jigar: We don’t add anything, but most videos have added their own context through the available channels. This is something we can still develop though; it would be good if we could add that content into the screen where you’re watching the media, but this needs to be done when we’ve developed a good system. But what if the user needs more? Jigar: Some users add links to other sources on the web, what we’ve done on a very basic level is to bring this content into the site, but at the moment in a simple form. Do you ever edit? Even if it provides better understanding to a user? Jigar: Only as far as finding stories that we find really interesting and then following them up through our own channels; making a more in depth doc or film about the topics already covered. Where’s your status of the editorial process? Jigar: When people login, they sign a non-exclusive right, it’s your content, but we have the right to use it in the future. Is this project more about the process or the end goal? It seems to me, it’s a lot about the people themselves, a reflective process for further understanding. 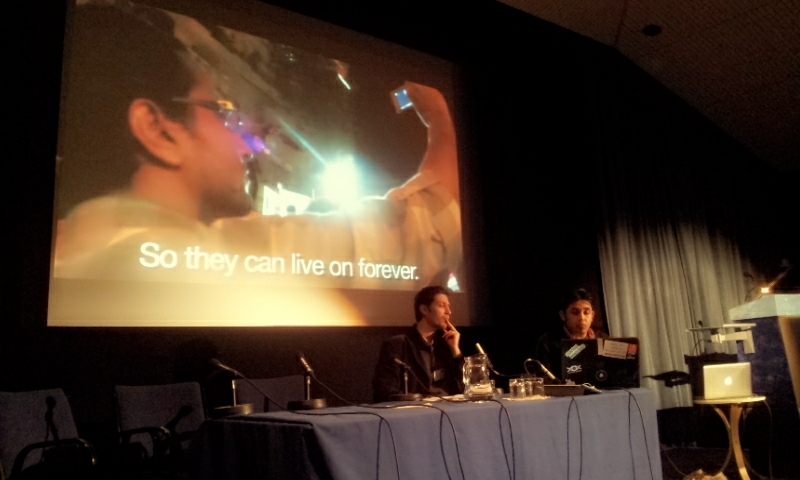 Jigar: It was originally about an end goal, to make a film – 90 mins about the revolution and social media – so I thought about how to do that. The media created was done by such interesting people, so now they’ve become such a massive part of this project and the film doesn’t seem necessary anymore. Have you contributed to the site at all? Really understand who your user is and get in their shoes! What does it mean for you as a community? Jigar: What does it mean for all of us as a community? For me, one of the biggest successes of the project is that I was willing to bend what the project was about – I let the user lead the direction of the project. I even adjusted the tools to make this participation easier. Did you get anything from the ‘other side’/the forces of oppression? Jigar: We’ve definitely reached out, our fellows have reached out to their networks which includes people within the forces but for them it’s a too sensitive time to tell those stories. Maybe in 5 years time, but not now.